Then turn on the current. The series lamp will light and a brilliant display of sparks will appear on the surface of the two aluminum sheets. When viewed in a dark room, these sparks will dart and flicker like a swarm of bluish-white lightning bugs. As the experiment continues, the sparking will grow less and less until finally both aluminum sheets will become incased in a ghostly, soft-white glow. Turning off the current, will stop the glow but it will reappear when the current is again turned on. Soon, the series-connected lamp, that once was brilliantly lighted, will get dimmer and dimmer. Finally it will go out. A formation of oxide on the aluminum sheets becomes thicker and thicker until it forms a non-conducting wall that cuts down the current. By substituting a strip of carbon or lead for one of the aluminum sheets, you can transform your novel glow cell into a simple liquid rectifier. Connected to an alternating current source, the cell will act as a one-way street, allowing only direct current to pass. To test the current flowing through the rectifier circuit, you need only cut one of the wires and place the bared ends on a piece of white paper wetted with a solution of salt water to which a few drops of phenolphthalein solution have been added. If direct current is flowing, the paper around the negative wire will turn red. On the other hand, if the current is alternating, the paper around both wires will turn red. In preparing this experiment be sure the current is shut off when wire is cut. While you are at it, you may as well make up a batch of this prepared paper for future use in your electrical work. Simply place the paper in the salt-water-phenolphthalein solution, allow it to dry, and place it in a tightly stoppered bottle. When you want to make a polarity test, tear off a piece of the paper, wet it, and bring it in contact with the two terminals of the circuit. BEFORE breaking up your electrolytic rectifier, lift the two electrodes out of the solution and study their surfaces. The aluminum will be covered with a dull white film of oxide. It is this oxide that allows the current to pass only in one direction. Around the home we find aluminum and its compounds in many of its varied forms. Most common, of course, is as a metal in the large assortment of kitchen utensils. However, when aluminum is combined with potassium, sulphur, and oxygen, it becomes potassium aluminum sulphate or alumâ€”the main ingredient of the styptic pencil you carry in your shaving kit. Liquid deodorants for excessive perspiration also contain aluminum in the form of aluminum chloride. Incidentally, a good product of this type can be made by dissolving about a tablespoonful of the aluminum chloride in half a tumbler of water. All solutions containing aluminum can be identified by the jellylike precipitate formed when ammonium hydroxide (ordinary household ammonia will do) is added. As a test, make up an aluminum solution by adding a piece of styptic pencil or a crystal of alum to a tumbler of water. When the ammonia water is added, the liquid will cloud up as the thick aluminum hydroxide precipitate is formed. Many aluminum compounds will react with ordinary water without the addition of the ammonium hydroxide to form the hydroxide of aluminum. It is this curious fact that makes it possible for us to purify turbid water simply by adding some compound of aluminum such as aluminum sulphate or alum. This action can be shown in a striking way. Select two similar jars or beakers and fill one with water. Drop a pinch of dirt and some household cleaner into the water and pour the resulting liquid back and forth from one jar into the other until the foreign matter becomes well suspended. Then place an equal amount of the liquid in each jar, stir one with a styptic pencil, and set them aside. In about eight or ten hours compare the two jars. The one treated with the alum will be clear while the other still will be a cloudy, turbid solution. In settling, the jellylike precipitate formed by the addition of the alum will have carried all the dirt to the bottom of the container. In the dye industry, this amorphous hydroxide of aluminum performs another important task. Many dyes will not enter the texture of some cloths directly. For this reason, the material is first soaked in baths of aluminum sulphate and ammonia water. This causes the aluminum hydroxide to be precipitated onto the fibers where it forms an adhesive for the dye. Chemically speaking, the aluminum hydroxide adsorbs the dye and holds it “fast.” In the industry, substances used in this way are called “mordants,” and the combination of the color and the aluminum hydroxide are referred to as “lakes.” Besides its many other uses in the home laboratory, ordinary alum serves as a particularly good substance for use in the study of crystals. Make a strong solution of alum in hot water and filter it. Then suspend a short length of string into a beaker of the hot liquid. As the solution cools, beautiful jewel-like crystals will form on the string. After several days it will resemble a necklace of clustered stones. By using an ordinary styptic pencil, the amateur chemist can make use of the crystals of alum to perform a mystifying experiment in magic writing. Words or sentences can be made to appear on a perfectly clean sheet of glass merely by pouring a solution (cold) of alum in water over its surface. The sheet of glass is first prepared by writing some simple word on its surface with the tip of a styptic pencil. The writing can be so light that it will be invisible to the casual observer. However, when the microscopic particles of alum left by the pencil come in contact with the alum solution, they serve as a starting point for a rapid crystal growth. Picking up alum from the solution, these tiny crystals grow until the writing appears as a broad white line. 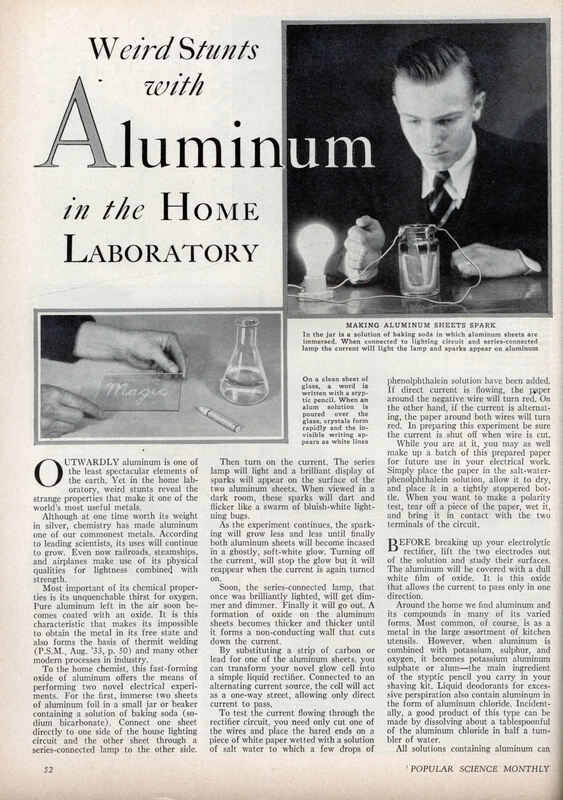 ALUMINUM powder such as is used in “aluminum” paints, fireworks, and flashlight powders is often put to another practical use that will prove a timesaver for the home experimenter. Combined with an adhesive mixture of the type obtained when celluloid is dissolved in acetone or amyl acetate, a so-called plastic solder is formed. You can make another type of aluminum cement by heating the aluminum powder with sulphur. Mix one part by volume of the aluminum powder with three parts of flowers of sulphur or rolled sulphur (brimstone) and heat the mixture in an iron container. For small quantities around the home workshop, you can place the mixture in the top of a sleeve-top can and heat it over the laboratory gas burner. Be careful not to overheat it, however. If it should burst into flame, extinguish it quickly by smothering it with a sheet of tin. Stir the mixture thoroughly during the heating. When it has become molten, pour it into a simple rectangular mold made by bending a narrow strip of sheet metal. To use the -solder” you have made, heat the stick with a match and allow the molten drop to fall into the hole or crack to be puttied. Bear in mind, however, that a metallic putty of this type cannot be used in all cases where soft solder is recommended. 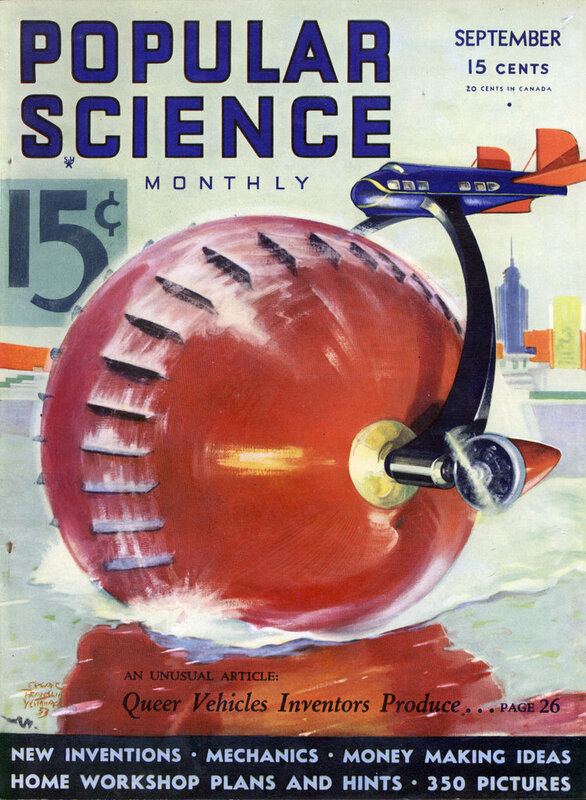 True, but today’s Popular Science probably wouldn’t even reprint this article today for liability concerns. Plus, none of those are nearly as cool as sticking a CD-ROM in the microwave.